Weekend Historical Happenings: 1/10/15 - 1/11/15 ~ The History Girl! On Saturday, Atlantic City Historical Museum monitor Katie Sundra will unveil the library's newest online exhibit - an interactive image map highlighting Atlantic City hotels, motels, and casinos - and will talk about their history. Program begins at 11:00 am. This program is free and open to all ages. For more information, call 609-347-5839 or visit www.atlanticcityexperience.org. "The Wonderful World of Snow Globes"
Take a clear dome, shake it well, and magically, a little scene or figure is enveloped in a slow-motion snowstorm. The miniature worlds under glass called snow globes have been delighting people since the 1800s. On Sunday from 2:00 - 4:00 pm, the Miller-Cory House Museum will celebrate these charming items in "The Wonderful World of Snow Globes." The program includes a display of globes for visitors to pick up and shake as well as a short presentation on their history. Children may also make a festive craft and enjoy storytelling. Admission is $3.00 for adults and children 13 and older, $2.00 for children ages 3 to 12 and free under age 3. The program runs from 2:00 - 4:00 pm. For more information, call 908-232-1776, e-mail millercorymuseum@gmail.com, or visit www.millercoryhouse.org. Long before Asbury Park became known for rock music, the city's African American community rocked on Springwood Avenue. Between 1910 and 1970, the city's West Side pioneered the sounds of jazz, gospel and rhythm & blues. Opening Sunday, see "Asbury Park's Springwood Avenue Harmony: Celebrating the West Side's Unique Musical Legacy." This exhibit explores, chronicles, and highlights Asbury Park's Black music scene from Count Basie to Billy Brown, through an impressive collection of rare photos and memorabilia. Working with the Asbury Park Historical Society, the Light of Day Foundation and Monmouth University's Center for the Arts, Classic Urban Harmony, LLC is spearheading a comprehensive museum-like exhibit that will be previewed at the Heaven Art & Antiques Gallery, 721 Cookman Avenue, Asbury Park, NJ, during the Light of Day concert series, January 11 - 19, 2015 (The Gallery is closed Tuesdays and Wednesdays. See the web site for hours: http://heavengallery.net). The exhibit will display scores of rare photographs plus phonograph records, posters, sheet music and other memorabilia from Asbury Park's West Side. It will contain sections on jazz, gospel, R&B, doo wop and soul music. It will also highlight black radio and record labels. One section of the exhibit will feature photos and ads for early Springwood Avenue nightclubs. Following the exhibit's close in Asbury Park, it will be expanded even further and moved to Monmouth University's larger Pollak Gallery on the university's campus at 400 Cedar Avenue, West Long Branch, NJ, for the month of February. This January, there are three interesting exhibits at Macculloch Hall Historical Museum (MHHM) to enjoy Wednesday, Thursday and Sunday afternoons beginning Sunday, January 4, 2015. There is still time to see the 2014 Christmas season exhibit "Another Stocking to Fill: Antique Christmas Toys and Decorations" which features toys and ornaments from a century ago. 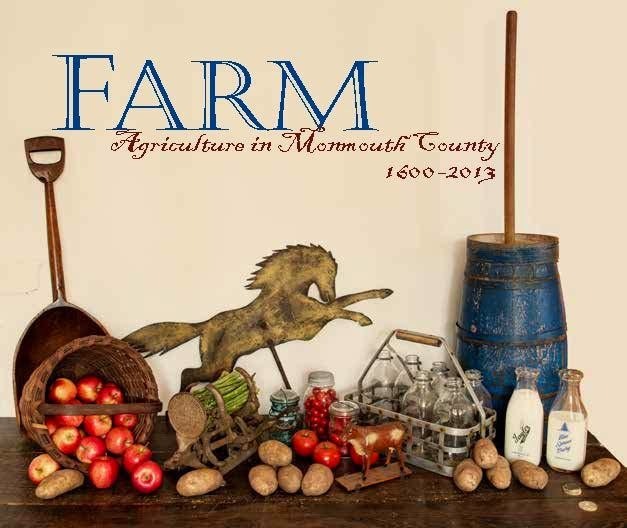 This was the seventh year this special exhibit have been created through generous object loans from "Sign of the Tymes Antiques" Lafayette NJ and objects from local collector Barbara Silverstein's collection. Enjoy this second floor exhibit during touring hours through January 29th. Visitors can also view illustrator Thomas Nast's original Santa and Christmas images throughout the museum's galleries and period rooms. The Museum has the largest collection of Nast originals in the nation. 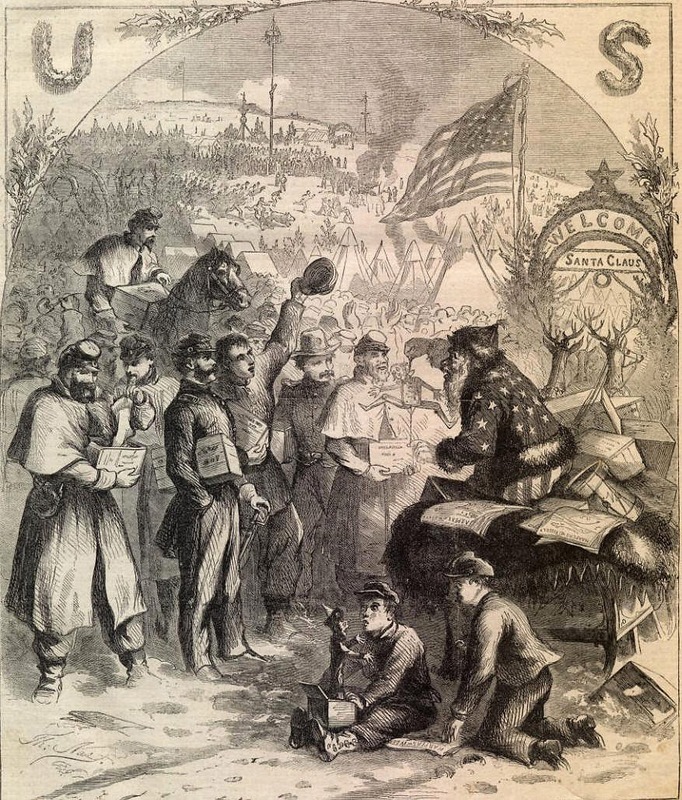 Thomas Nast (1840 - 1902) is one of the most recognized names in the world of political cartoons. Often called the father of American political cartooning, Nast's images remain popular today. His well-known depictions of the Democratic donkey and Republican elephant continue to represent both parties. Uncle Sam and Columbia, two of his favorite figures to draw, are still recognized as symbols for the United States of America. Nast's Civil War images of battlefront and home front were powerful tools for bringing the war into people's homes. Visitors can explore more of Thomas Nast's work in the second floor gallery exhibit "The Civil War through the Eyes of Thomas Nast". Nast illustrated battles, Union and Confederate troop movements, and their activities throughout the Civil War. He also captured the poignancy of those back home, who worried about their family members in combat. Nast covered both the home and battle fronts; his work was the main source of information about the war for many people. His illustrations in publications like "Harper's Weekly" brought the information about what was happening into the homes of the American public, the way mass media does today. Like all media agents, he not only depicted what was happening by reporting on the events taking place, but also created propaganda by trying to stir emotions and support for the Union side. Mounted to commemorate the final year of the Civil War Sesquicentennial (2011-2015), "The Civil War through the Eyes of Thomas Nast" will be on exhibit through August 2015. In the main gallery exhibition "Thomas Nast: Unknown Works and American Icons" MHHM displays an important collection of rarely exhibited, virtually unknown works. Previously unpublished oil paintings and watercolors, rarely seen pencil sketches, pen and ink drawings, and original architectural elements from the artist's home are among the objects presented in the exhibition. In addition to these and several never-before-exhibited pieces, some of Thomas Nast's best-known characters will also be on display. Pencil sketches of Nast's family from his early years as well as paintings he created toward the end of his life around 1900 will be on display. Nast worked with a variety of mediums as well as producing images not just of political life, but social as well. He drew images of famous people of the time as well as his own family life and enjoyed putting his own image down on paper as can be seen by the variety of self-portraits exhibited. The museum is open for house and exhibit tours on Wednesdays, Thursdays, and Sundays from 1:00 - 4:00 pm. The last tour ticket is sold at 3:00 pm. Adults $8; Seniors and Students $6; Children 6 - 12 $4. Members and children under 5 are free. Macculloch Hall Historical Museum is located at 45 Macculloch Avenue, Morristown, NJ. For more information, call 973-538-2404 ext. 15 or visit www.maccullochhall.org.